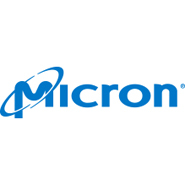 Home / Stock Picks / Stocks to Buy / Micron Technology, Inc.: Technical Reasons MU Stock Can Rally! 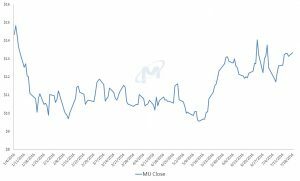 Micron Technology, Inc.: Technical Reasons MU Stock Can Rally! It’s been a raw deal for investors of Micron Technology, Inc. (NASDAQ:MU). Despite modestly beating Wall Street’s downcast earnings expectations for the third quarter of fiscal year 2016, top-line sales slipped 25% from the year-ago level. The markets subsequently punished Micron stock, dropping it by nearly 15% before stabilizing. Such turmoil is par for the course for MU stock, which is currently down over 5% year-to-date. But before dismissing MU as another victim of the shrinking and crowded person computer market, we have to see the dual-sided dilemma. On one hand, most investors are focused on the disaster of 2015, when Micron stock shed 59% from investors’ portfolios — the worst loss in MU since the 2008 global financial crisis. On the other hand, shares have experienced tremendous nearer-term momentum. Over the past 90 days, Micron stock is up almost26%. So, which one is the real deal? InvestorPlace contributor Brian Wu makes a compelling argument that Micron stock isn’t the fundamental basket case many fear it to be. The company’s product pipeline — including the 3D XPoint — opens up new possibilities. Most importantly in my opinion, MU is downsizing, which can help the organization adjust to the new realities of the semiconductor market. Of course, the markets can sometimes have the annoying tendency of ignoring the fundamentals. Given its historical volatility, investors will want more than positive vibes to risk taking a stab at MU stock. Click to Enlarge Luckily for the bulls, there are a number of technical factors that back up the optimistic view. Let’s start with the low-hanging fruit. In the 1990s, annual returns for Micron stock averaged 55%. For the following decade, the average slipped to a relatively pedestrian 11%. This dark period was marred by geopolitical conflicts as well as a banking and financial crisis. 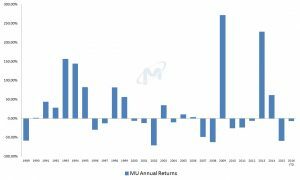 But in the current decade, investors of MU stock have averaged 29% in returns. Granted, most of that came from a phenomenal 2013; however, it does open up doors for contrarian trading strategies. Potential investors should also look into the frequency and patterns of bearishness. Since its initial public offering in May of 1989, Micron stock has never gone past three years of consecutive losses. Better yet, MU stock has a tendency of responding strongly after prolonged down cycles. 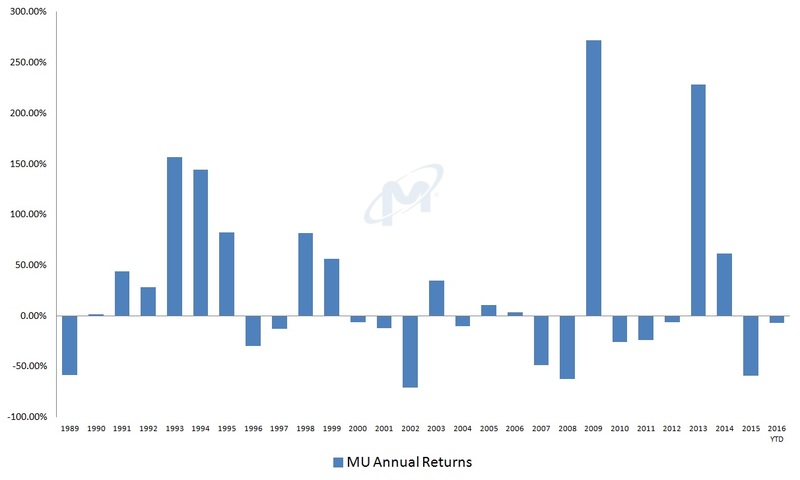 Also, MU has never followed an annual loss of magnitude 50% or greater with another loss. If that record were to hold true, shares will have to turn positive over the next five months. While the 90s was the definitive decade for the PC industry itself, the current decade is a goldmine for speculative semiconductor trading. From 1990 until 2009, the average return for Micron stock when it was net positive for the year was 77%. From 2010 onwards, that average spiked to 145%. What this translates to is volatility. 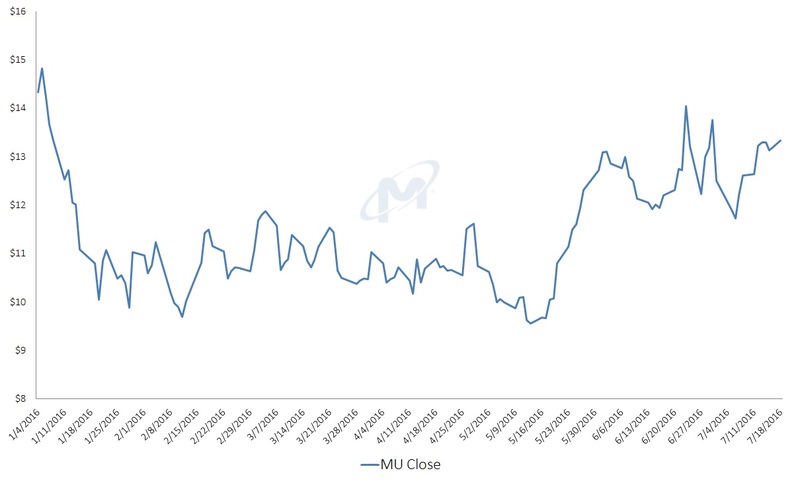 MU stock has taken heavy losses over the past six-and-a-half years. But at the same time, people who dove in when others were fleeing have done extraordinarily well for themselves. I don’t want to dismiss the company as a high-level pump and dump. Nevertheless, Micron stock has consistently rewarded those that were willing to take that initial risk. Click to Enlarge With all that said, the opportunity should still be approached with a strong degree of caution. From two months ago in May until now, MU stock appears to be charting a bearish head-and-shoulders-looking pattern. Clearly, there’s some resistance there that needs to be worked out. Either way, Micron stock will likely find at least some turbulence. Ultimately, though, the bull case isn’t without merit. While debate will undoubtedly rage concerning the possible revival of the PC market, many on Wall Street are gambling on MU stock. That’s comforting news for those wishing to take a bite of the apple. Also, Micron stock has consistently pulled off remarkable comebacks. The intensity of those rallies has been particularly acute in recent years, which could be the decisive factor for many investors. Article printed from InvestorPlace Media, https://investorplace.com/2016/07/technical-reasons-micron-stock-mu/.